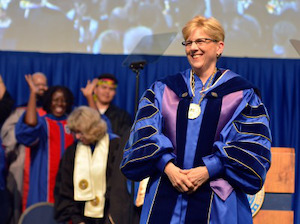 Gallaudet University inaugurated its first deaf female president on Friday afternoon. Roberta Cordano stepped into the role of president last January, a move that was formalized in Friday’s ceremony. From the start, Cordano demonstrated herself to be a hands-on type of leader. A few weeks into her presidency, a massive blizzard known as Snowzilla engulfed the District of Columbia. Gallaudet lost power to over a third of its campus, and school officials had to decide overnight how to house students and faculty families living on campus suddenly displaced by the loss of power. As a native Midwesterner, Cordano put her cold weather know-how to good use, shoveling snow and inviting 13 students to stay with her in the president’s mansion during the power outage. “That experience here really ingrained us the sense of a community, because we all chipped in to help each other,” Cordano told Diverse after the inaugural ceremony. Cordano’s presidency is an expression of Gallaudet’s quest for self-determination. Gallaudet is the world’s only liberal arts institution for the deaf and hard of hearing, but from its founding in 1864 up until 1988, it was led by hearing presidents. Radical change only occurred after the student-led “Deaf President Now” (DPN) protests rocked the university in the late 1980s. In 1988, the Gallaudet Board of Trustees selected Elisabeth Zinser, vice chancellor for the University of North Carolina at Greensboro, as the institution’s seventh president. Zinser was not deaf and, as a result, her selection was met with fierce criticism from the student body. DPN shut down the campus for eight days, Zinser resigned, and the board brought in I. King Jordan, the school’s first deaf president. Jordan presided over the school for nearly two decades, and in 2006, was succeeded by Robert Davila and subsequently T. Alan Hurwitz. All three were on stage at Cordano’s inauguration to welcome in the new president. As Gallaudet’s first deaf female president, Cordano brings a wide range of experience from her work in a diverse array of fields. She comes to Gallaudet from the Amherst H. Wilder Foundation, a social service nonprofit organization based in St. Paul, Minnesota, where she was the vice president of programs. Her career began in the Minnesota attorney general’s office, where she was an assistant attorney general. She went on to work in the health care industry, and also was dean of the Hubert H. Humphrey Institute of Public Affairs at the University of Minnesota. Cordano is also a founding member of the Metro Deaf School and a founding board member of the Minnesota North Star Academy. The two schools have since merged into one institution. Although three generations of Cordano’s family attended Gallaudet, she herself earned an undergraduate degree from Beloit University and a law degree from the University of Wisconsin. In her inaugural address, Cordano stressed the importance of Gallaudet’s role in ensuring greater awareness of the deaf community. She noted that, at the time of the DPN protests, there were fewer than 20 deaf attorneys in the United States, but that today there are close to 400. She also said that Gallaudet must re-examine the requirements of a robust liberal arts education. “It is important that we prepare our students, staff and faculty for successful careers, strong personal awareness and community engagement,” Cordon said. After the inauguration, Cordano told Diverse that Gallaudet is already making moves in that regard. The university recently added a new risk management and insurance program, which has already seen significant growth. “There have been very few deaf individuals who have gone into that field, and it’s a really good field and career for them to seek opportunities in,” she said. She also pointed to the digital media lab and the Center for Deaf Documentary Studies as some of the other places on campus where innovative work is happening.